1. Bring water to a boil in a medium sized pot. Salt the water and add in your pasta, reduce heat to medium, and cook. 2. 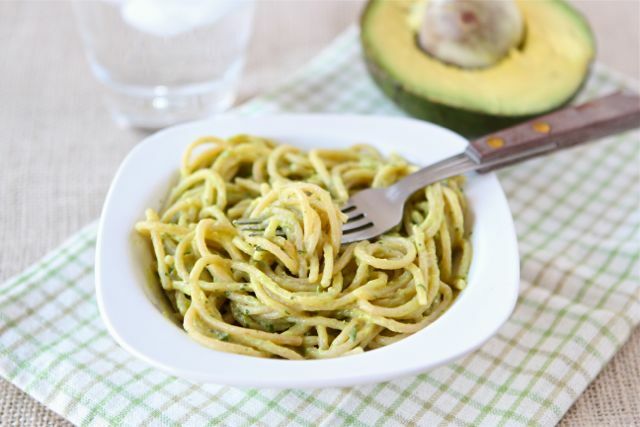 While the pasta is cooking, make the sauce by placing the avocado, garlic, lime juice, cilantro, salt and pepper into a food processor or blender. Process until smooth and creamy. 3. When pasta is done cooking, drain and place pasta into a large bowl. Add the sauce to the pasta and toss until pasta is well coated. Season with additional salt and pepper, if desired. Serve immediately. Oh this looks & sounds absolutely delicious!! Thats a great summer pasta idea. It really is. And it doesn't make to much either :) This is kind of a eat it that day pasta. This recipe looks great! Thank you so much for linking up for GFC Lovin' today! It is! And thank you! YUM. Oh my gosh, that looks delicious! Umm I need this RIGHT now.